Generally sunny despite a few afternoon clouds. High 69F. Winds N at 5 to 10 mph..
Crate & Barrel’s stackable porcelain Logan bowls. MUST CREDIT: Crate & Barrel. Avesta stoneware from Project 62. Apilco’s Tuileries dishes. MUST CREDIT: Williams-Sonoma. West Elm’s textured dinnerware. MUST CREDIT: West Elm. It’s entertaining season, and maybe you’re hosting Thanksgiving for the first time. Or maybe you’re getting married and merging households. No matter, you’ll need dinnerware. And experts agree: Choose white. 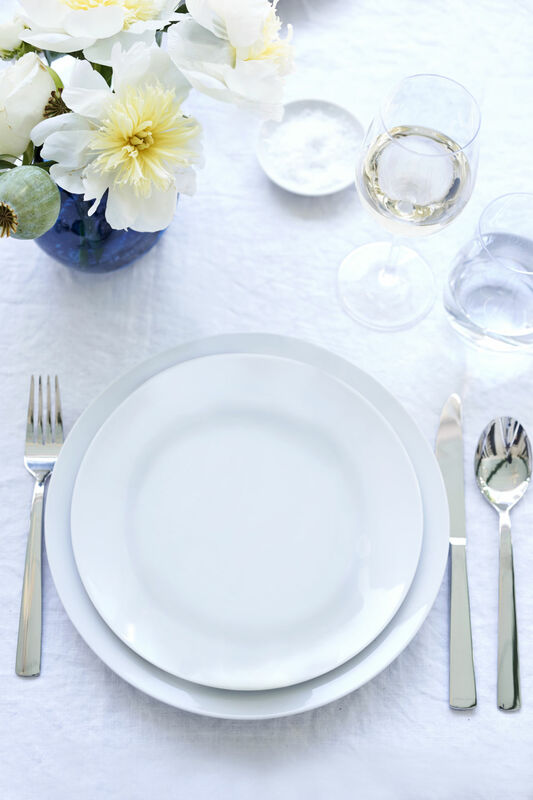 White comes in many shades, and the dinnerware comes in many types, so we asked tastemakers for their advice and recommendations. Logan pieces are sold individually or in sets of eight, such as eight dinner plates. Eight four-piece place settings would run $179.80. To set a trendy table this season, Boyd says to mix white dinnerware with two other elements: muted neutral pottery and wooden serving spoons or, if you lean modern, black cloth napkins and accent dishes in a primary color. Nik Sharma, food columnist for the San Francisco Chronicle and author of the cookbook “Season: Big Flavors, Beautiful Food,” loves color in his food, not in his dinnerware. “I like color, especially in vegetables and salads. Sometimes ingredients like balsamic vinegar are so dark, and then when you put them on a dark plate, you can’t see them. I like to see them,” he says. To Myquillyn Smith, author of “Cozy Minimalist Home: More Style, Less Stuff,” white is the obvious choice for dishware. “I want a simplified collection of dishes that stack easily, look great together and take a beating from our family,” she says, recommending the Avesta stoneware from Project 62 ($19.99 for four three-piece place settings of dinner plates, salad plates and bowls, target.com). Apilco’s Tuileries dishes will “last a lifetime,” says Katie Jacobs, author of “So Much to Celebrate: Entertaining the Ones You Love the Whole Year.” “They’ll never scratch. They’re restaurant-grade.” ($383.80 for four place settings of dinner plates, salad plates, soup plates, cups and saucers, williams-sonoma.com). For holidays, she’d pair them with a paper tablecloth, a big bowl of Christmas ornaments and a handmade place card, “an additional touch that makes your guest feel special.” Some pieces are also sold individually and in sets of four.